Happy April from Cambridge! We hope you had a great March, and that you’ll enjoy the latest features we’ve added to the edX platform. We want to help your learners move through the e-commerce workflow successfully! To improve the user experience, we have updated our Checkout page. This page offers the same functionality as the former page, but is streamlined and more intuitive. For more information about e-commerce in edX, see Adding E-Commerce to the Open edX Platform in Installing, Configuring, and Running the Open edX Platform. Additionally, for courses that include open response assessment (ORA) assignments, a new “Peer Instruction Question” heading and “Explain to other students why you chose this answer” cue for the final answer text box make these problems easier for learners to navigate. We know you want to get your course About page up and running as soon as possible. To help, we’ve made two fields optional for instructor biographies: Course teams no longer have to fill in the Organization and Title fields before they post an About page. If your course includes ORA assignments, you’re probably curious about the responses that your learners submit to these responses and about the way their peers assess these responses. A new report for ORA assignments includes information such as each learner’s response, assessment details and scores, and learner feedback for each ORA assignment in the course. For more information, see Generate a Report for ORA Assignments in Building and Running an Open edX Course. Speaking of ORA, we have updated the Best Practices for Open Response Assessments section of Building and Running an Open edX Course so that it advises course teams to include only one ORA assignment per unit in Studio. And speaking of documentation, we’ve improved the search feature! You can now include non-alphanumeric characters, such as underscores (_) and slashes (/), when you search for content on Chrome, Firefox, and Internet Explorer. This means you can now search the EdX Research Guide for the problem_check event, or for the phrase “A/B test” in Building and Running an Open edX Course. Additionally, the search results now show you excerpts from the documentation, so you’ll have a better idea of whether you’ve found the right information before you view a topic. If you are running the latest version of the Open edX platform, you can take advantage of several improvements. Thanks to an open source contribution, you can now add the CourseTalk widget to your instance of Open edX. 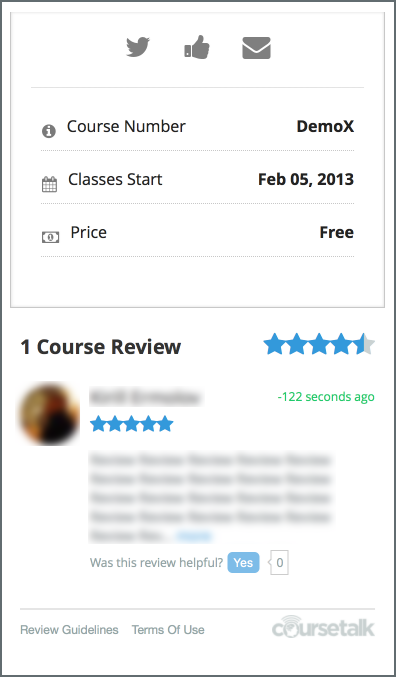 Learners use the CourseTalk widget to post ratings and reviews for a course on the course’s About page. For more information, see Adding the CourseTalk Widget. The documentation team has reorganized the Installing, Configuring, and Running the Open edX Platform guide and some sections of the Open EdX Developer’s Guide. We have also added the glossary from the Building and Running an edX Course guide to the Building and Running an Open edX Course guide. We hope that these changes help you find the information that you need more easily. A new, more flexible and accessible drag and drop problem type is currently in the works! The days of using tools to find screen coordinates and then keeping track of values to enter in XML will soon be past. The new problem type will eventually replace the current drag and drop problem type for new course content, but don’t worry—those older drag and drop problems that you worked so hard to create will still work.